Elegant new custom home in highly desirable Metro Verde area near Red Hawk Golf course. 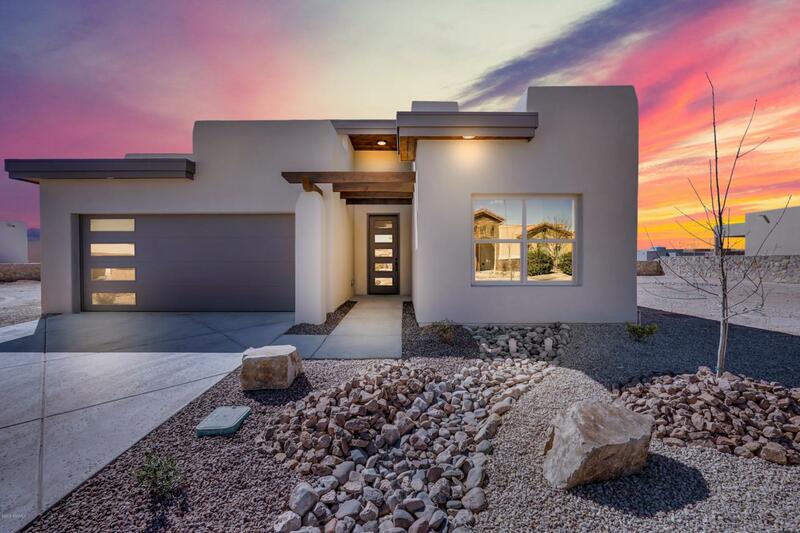 Beautifully designed open floor plan with 2X6 construction has a contemporary pueblo style elevation with elastomeric stucco and picturesque organ mountain views from the backyard. The 4 bedroom 2 bath home has gorgeous hardwood tile flooring that extends from the foyer throughout the great room and kitchen with 8 ft entry door, custom paint, and custom deco work. Open kitchen-family room in the heart of the home with 12 ft ceilings. Upscale kitchen features a spacious kitchen island, pendant lighting, granite counter tops, subway tile backsplash, oil rubbed bronze fixtures, farm house sink, and stainless-steel appliances. Family fireplace will keep you warm during those cool NM nights. Master suite in the back of the home with barn door. Spa-inspired master bath features dual sinks with vanities, separate make-up vanity, luxurious rain shower, and expansive walk-in closet. Listing provided courtesy of Raul Tellez of Exit Realty Horizons: (575) 532-5678. All listing information was provided by Southern New Mexico Multiple Listing Service.